We have a few hours to kill between hotel check-out and cruise boarding, and our hotel is nice enough to keep our bags in storage for the day. It’s enough time to go to the Chiesa di San Pantalon and see Fumiani’s famous ceiling painting of the life of Saint Pantaleon: a masterpiece of trompe-l’oeil which makes the church appear taller than it is, open to a sky spilling over with baroque figures in every direction. It is a wonder to just sit there, looking up, for an hour. No photography allowed. Next, walk back to Lista di Spagna for a cheap lunch at Brek. I get a small bowl of salad and a large plate of prosciutto di parma with a ball of mozarella cheese whose sheer raw flavor is almost too wonderful to bear. With still some time left before departure, we saunter into the Chiesa di San Geremia, where the 1700 year old body of Saint Lucy lies in state, viewable in a glass case. Sadly the patriarch of Venice who would become Pope John XXIII had her face covered by a silver mask in 1955, so Lucy’s famous holy eye sockets are hidden from view. No photography allowed. At last it is time to leave Venice. Weeping bitter tears (not really but almost) we fetch our bags from the hotel and haul them down to Piazzale Roma, up to the Venice People Mover and on to the cruise port. Pre-embarkation is a singularly unpleasant ordeal, from the arduous march across multiple parking lots from People Mover station to cruise terminal (whose idea was it to have the station so far from the terminal?) to NCL ground staff directing us to the wrong cruise line (almost ended up on a Royal Caribbean ship) to more NCL ground staff telling me I can’t bring 6 bottles of water on board (I totally can, and we don’t entirely trust the ship’s tap) to rude security personnel getting mad at me for having a Swiss knife buried deep in my bag (okay, that was my fault; I should have known better than to pack a swiss knife). I can’t help but think of a passage from David Foster Wallace’s ASFTINDA where he theorizes that cruise lines deliberately make the pre-embarkation experience miserable to heighten the contrast with the luxury on board the ship. 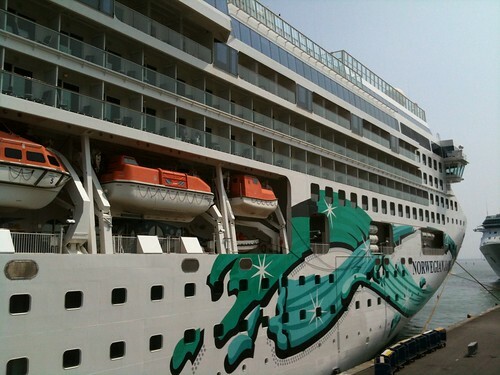 Soon we are in our cabin, the forwardmost portside balcony stateroom. 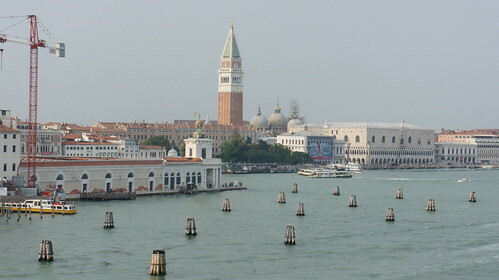 The view of Venice as we depart is surpassingly beautiful, as the ship goes eastward along the Rio de Giudecca, right in front of the south end of Dorsoduro, Piazza San Marco and the Doge’s Palace, the gardens of Castello, Arsenale, and Sant’Andrea. It’s a fitting end to our trip, though I reflect that our stunning departure view of the city comes at a price: giant cruise ships contribute to the decay of Venice through pollution and wake erosion. 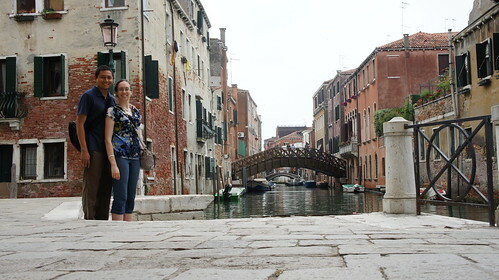 Locals feel that placing the port right in Venice proper was a mistake that ruined the historic ambience of the place — and yet they cannot deny that the cruise lines bring in crowds of tourists, and not all Venetians are willing to lose that income for the beauty of an unmarred skyline. 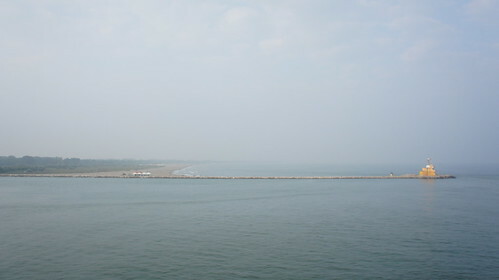 Soon a beach and a lighthouse slide past, and we are out of the lagoon and in the open Adriatic Sea. Ciao.